Effective responses to sexual and gender-based violence was the topic of a course delivered in Odesa on 1-2 December for 30 participants from different regions in Ukraine working in the National Police as well as the educational institutions of the Ministry of Internal Affairs. The training was organised by the OSCE Office for Democratic Institutions and Human Rights (ODIHR) in cooperation with the EU Advisory Mission Ukraine (EUAM) and the La Strada Ukraine International Women’s Rights Centre. In a wide-ranging course aimed at strengthening the capacity of investigators to identify, detect and prosecute gender-based violence and increase gender awareness among educators in Internal Affairs institutions, EUAM’s role was to provide expertise in forensics, criminal investigations and integrating a gender perspective into law enforcement operations. 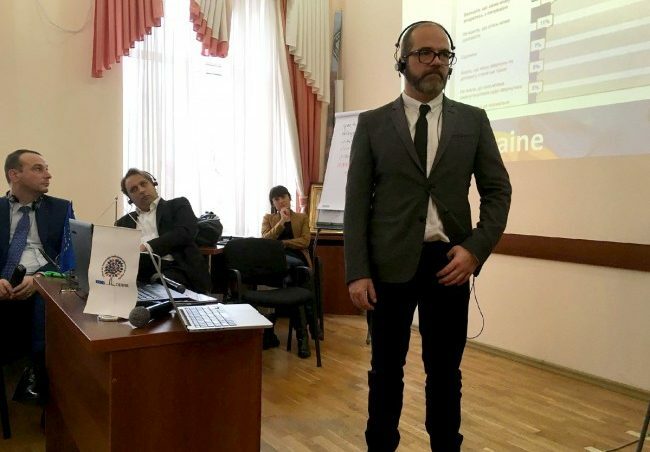 EUAM Senior Adviser on Prosecution, Maarten Groothuizen, shared best practice from Dutch jurisprudence and investigative procedures, while Community Policing Training Officer Dmytro Melnyk organised a role-play training session on gathering forensic evidence in cases of sexual assault. Gender Adviser, Soren Sonderstrup focused on raising awareness of gender perspectives and how these can influence decisions taken by law enforcement authorities. “The needs of victims of sexual and gender-based violence need to be addressed at all stages of criminal investigation and from multiple institutional angles in order to bring about justice and accountability,” said Sonderstrup. “No matter whether violence happens at home, in places of detention or during an armed conflict, it is always a source of instability in a given society and an indicator of its state of health,” said Graziella Pavone, ODIHR Human Rights Officer. The approach taken was ‘train-the-trainers’ and participants were therefore also given advice on how to transmit the information provided in the training to their colleagues in future. Participants will report on their progress in six months. The course contributes to the implementation of Ukraine’s National Action Plan on UN Security Council Resolution 1325 on Women, peace and security.